This week was a bit bumpy with wax. I had some good ones and some not so good ones. I was surprised by one of these too this week. My Thoughts: Yes, I may have purchased this one because it has cat-like name. That being said it does smell good. This to me smells like tea, honey, and a hint of a white floral (probably jasmine). It reminds me a lot of this discontinued L'Occitane Green Tea perfume I used to have years ago. It's a very cozy and elegant scent. I really like it, it's different than my usual soothing scents. My Thoughts: I was really unsure about this one on cold sniff. It smelled too floral to me. I went ahead and melted it anyway and I loved it. This is a rare situation. It's usually the opposite situation. I like something on cold sniff and don't like it melted. I found when melted, this had a perfect blend of watery/sea salt ocean notes and floral. The floral was just the right touch when melted, while on cold it was too prominent. The ocean notes really came out on warm that made this a really fresh and nice scent. My Thoughts: I'm giving up on Yankee. This type of scent is totally up my alley, but I don't like it. This smells so artificial too me it's nauseating. The notes in here are so synthetic it smells like harsh laundry detergent and chemically. I love sage and citrus notes in other brands, but this just smells so fake to me. This is the 2nd or 3rd time I've had this issue with Yankee scents. I'm done. My Thoughts: I love lavender and I love herbs. This is nice, but it's like a mellowed down version of ScentSationals Spa. There is nothing wrong with it, I just have better lavender blends through ScentSationals and Ten Digit Creations. I like my herbal soothing scents to pack a punch and this one is just too light. 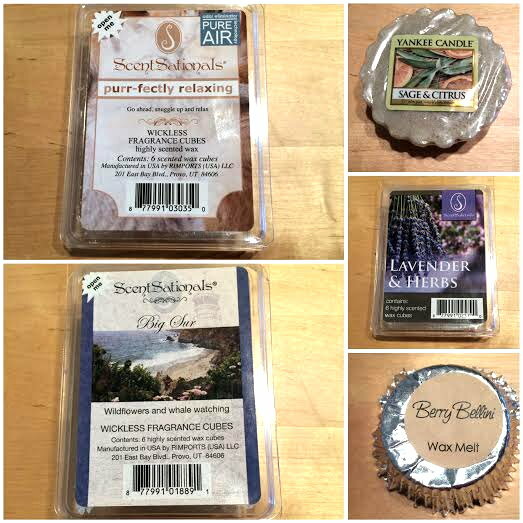 My Thoughts: Berry scents can go one of two ways for me. They're either too sweet or just right. This is the latter. This has a sharp tart berry note, some citrus, and great fizzy champagne note. I love those fizzy scents, and the tartness from the berries makes this perfect. Coconut is in the description, but I don't smell it. That's a plus for me since I don't care for coconut much. This is a fun festive scent for the holiday season or year round.